Getting your kids to brush their teeth can sometimes be a dreaded task for parents. A lot of kids, especially younger ones, are uninterested in good oral hygiene and would rather eat sweets than brush their teeth. It is important to teach your kids at an early age the importance of brushing their teeth and having a clean and white smile. As a parent, you must find ways to make brushing more enjoyable for them. There are plenty of ways to do this especially with the different toothbrushes and toothpastes designed for younger kids. Here are some tips for keeping brushing teeth fun. Make brushing fun by purchasing bright colored toothbrushes or a brush with their favorite cartoon character on it. A lot of brushes are now designed for children. You can also let your kids pick out their own toothbrush, this way you’re sure they’ll like the toothbrush you bought. Toothpaste it also made the same way, in bright colors, fun flavors, and characters on the toothpaste tube. Listening to music or brushing your teeth with your kids will also make it more fun. Introduce brushing gradually. First you should start with having them brush with just water and then introduce using toothpaste at a later time. 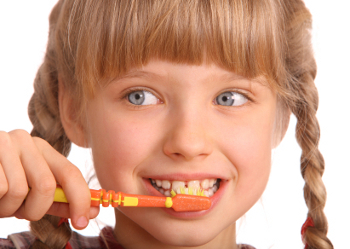 A lot of parents want to brush their kids’ teeth for them, but you should let them to brush their own teeth as well. You can always follow up and brush for them after they have tried it themselves. Just as you brush your kids’ teeth, maybe you can let them brush your teeth too! Do not use toothpaste made for adults. Toothpaste intended for adult use can have a flavor that is too strong or spicy and this will make the brushing a dreaded task instead of a fun one. Kid’s toothpastes are gentler and usually in a fun flavor such as bubble gum. Just use a dab at the beginning and then increase the amount when they are used to it. While making teeth brushing fun, you should also teach your kids the proper technique. You can show them by brushing your teeth with them. Sometimes, the way you brush is more important than the amount you brush for. It can be a challenge to keep your kids brushing their teeth for a few minutes after every meal. This is where playing music can be a fun idea too. Play a short song while they are brushing, and when the song is over they will know they have brushed for long enough.